FC Rostov have revealed on Twitter the gift presented to them by Manchester United manager Jose Mourinho ahead of their Europa League clash at Old Trafford. 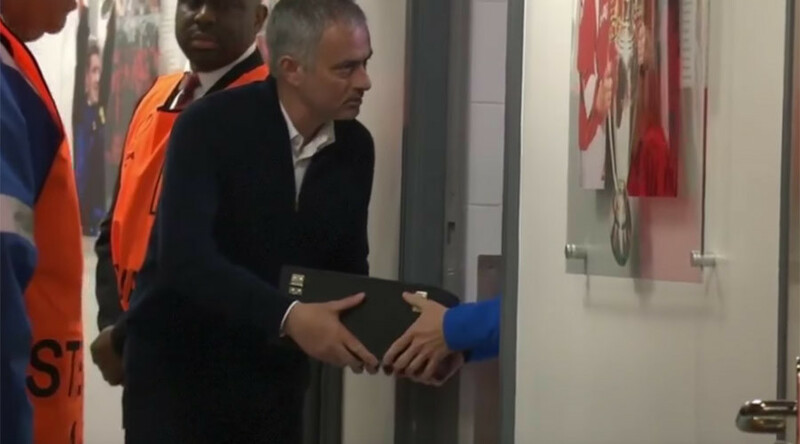 United manager Mourinho aroused interest when he was snapped passing a mystery black box into the Rostov dressing room ahead of the Europa League round of 16 second leg between the two sides. The Portuguese coach had originally presented the box to Rostov coach Kurban Berdyev. The two first met when Mourinho’s Inter Milan side took on Berdyev’s Rubin Kazan in the group stages of the 2009/10 Champions League. Inter went on to win the competition that year to give Mourinho his second Champions League title, and the Portuguese coach hadn’t forgotten his old friend. FC Rostov’s official Twitter account also revealed that one of the team members was reading the biography of legendary manager Sir Alex Ferguson, who lead United for 26 years before retiring in 2013. Relations between Rostov and Manchester United and their respective sets of supporters had been friendly since the first leg of their tie in Russia, where locals presented traveling United fans with red blankets with “Gentlefan Russian Warm Welcome” written in white lettering. The traveling English fans later stated that they had been “treated like rock stars” and Mourinho echoed those views in his post-match press conference, where he was presented with his own blanket and asked his opinion of the Russian fans. “I think everything was magnificent. People were nice to us since we landed," Mourinho replied. “My view is that everything went wonderfully well in Russia – apart [from] the pitch, but the club was so nice to us, the people around the hotel and the airport were so nice to us,” he added. In the return leg in Manchester, the home fans returned the favor by presenting Rostov fans with travel guides to help navigate their way around the city. United went on to win the match 1-0 courtesy of a Juan Mata goal, meaning the tie ended 2-1 on aggregate, with the Old Trafford side progressing to the Europa League quarter-final stage where they will play Belgian club Anderlecht.